When spring calls for a romantic mood, one of the things that should be your beloved crush is one of these bags. Then again, since purple will always be my favourite colour, the Balenciaga giant chic box bag will be on my top list for spring essential. 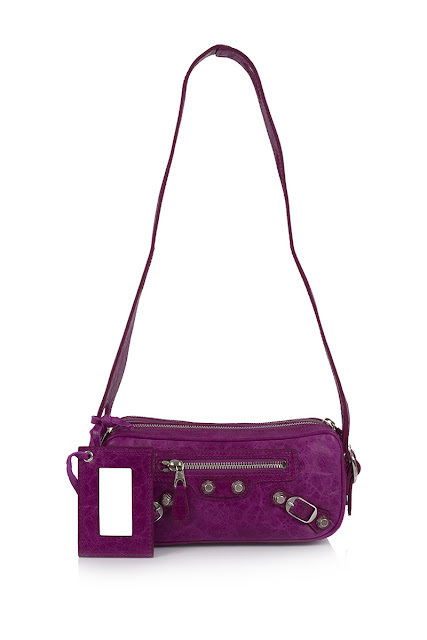 This arm candy features buttery soft leather in gorgeous purple colour and the size fits for daily use or just for special occasion. From day to night, monday or saturday, it does not matter as this bag is so versatile and gives no hassle. It can be the accent of your whole outfit, or maybe the sweetest complementary thing of your day. Read on to find out my three spring ensemble that go well with this adorable bag. Colour block is the biggest hit this season! Bright+bright will never be boring. In this case I choose purple+orange, that i believe goes hand in hand with the purple bag. Play and explore with complementary colours, but it is advised to have several neutral accesories as well. Inspired by the beautiful neon colours of flowers, such as peony alike, fluorescent accent is really fun to match with! Pair it with neutral pieces and you're good to go. Oh, don't forget to put your best accesories to complete the look! There are whole lot of spring prints to choose from! From flowers, fruits, or animals. Pick one that you're fancy with and match with some pastel colours for a different mood (and of course will accentuate the purple bag). Oh, and probably it's time to take your oxford shoes out for playing in the park. Picnic, anyone? i love all three outfits ! i love your purple shorts too ! i love the ensemble with the hippie band and red skirt the most...you're just the most adorable. I love the explanations after the outfits! I definitely love the bright + bright; it adds so much happiness to my life, simply wearing colorful stuff like that :) awesome blog!! those outfits photos are so great and inspiring! you're so great kak! I really like your blog, follow you. where it comes from ? LOVE your color block look! i love your purple shorts fhennn!! All three outfits are great but the first one is my favourite! The colours suit you so well! where did you get the birdprint jacket, ci fhen? So gorgeous. Hi kak Fhen! The three outfits go perfectly as colorful as spring! You mix em very well kak! I like your first outfit the most..it looks so natural.. If i had to choose... i would say the third one! I love the pastel outfit best. Thank you for the comment, i'm now a new follower! So many gorgeous looks, darling! Especially loving the first outfit! I love bright colors. I can't even choose a favorite outfit among these. Lovely outfits. Thanks for your comment on my blog. 2nd outfit is awesome! You are so gorgeous! i'm loving all three looks, but i'm especially in love with the pastels and prints outfit. :) i love your style. following! I really like this post! Nice blog! All of these outfits are spectacular, you look ready for spring. I can't wait for the weather to come around here too, it's too cold now to think about skirts and shorts. thank you for the lovely comment fen, I've followed you already and even linked your blog.. LOL... btw where did you get the oxford shoes?? nd the different outfits doll! i have a new outfit, will you take a look? everyday a new post . Great outfits! They all look amazing! Purple is my number one color as well! You are soo adorable. Thanks for stopping by my site!! Yours is great, I'm following now! nice outfit! simple and beautiful :)) please visit my blog sometime. xoxo. I love how you wear those bright colors!!! wonderful post!! I definitely need more color in my wardrobe! i love your outfits the colors are beautiful!! Wow you look amazing in all the outfits! I love the colors! great blog! thanks for coming by mine! you're adorable with great style! Babe I love your use of colours= great skirt, the shade is amazing! Love your golden sandals too!!! you look so pretty! love your swallow print jacket and your purple shorts, gorgeous! These outfits makes me feel like spring is near ;) Love them!! pretty bags!! 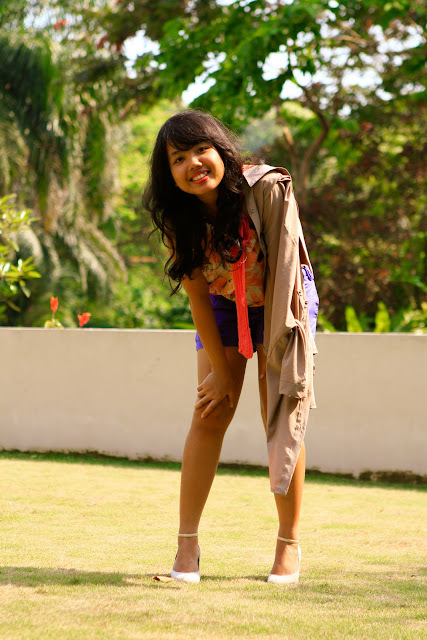 and i love the outfits too :) goodluck with the contest! LOVE ALL THE STYLES :D so inspiring!!! goooooooosh cutie, thank you so much..
Beautiful bags and outfits girl! Oh and thanks for dropping by my blog :). I don't use blogspot and your blog doesn't have the Name/URL option available so I'll leave my link. I don't normally do this but just so you know I replied lol. I meant to say grey shoes :). And I like the second outfit best. Great blog you've got here! Following yoU! I love the pattern+pastel outfits ci! cute yet awesome hihi! Thank you for visiting un-stitched! I love all your outfits, especially the purple and orange, my absolute favorite color combination. LOVE all the colors !!! Super nice !! you have such cute shoes! aw aw aw. i love everything. literally everything! I'm in love with these looks. The neutral/neon one is my favorite, but I also adore the shoes you're wearing in the last set. The Balenciaga is a great choice by the way. Such a cute style! Oh the colours in your outfits are lovely. The purple bag too...is just gorgeous! Mmmm... Can't really choose which one is my fave since you're looking adorable in each of the outfit pairings! But the pink skirt is totally cute - i like the way it put more statement than the other items. Hypeeed, fhen! i like the first one best! looks warm where you are- jealous! Aaahh, all these adorable colours look great on you. I really, really want a bright coloured bag, too! Ahh, these outfits are lovely, i really like the prints and pastels one! I like the colorblocking trend - perfect idea for spring and summer! And I hope many would contunite incorporating it intheir wardrobes well into winter - all those neons are such awesome mood boosters! 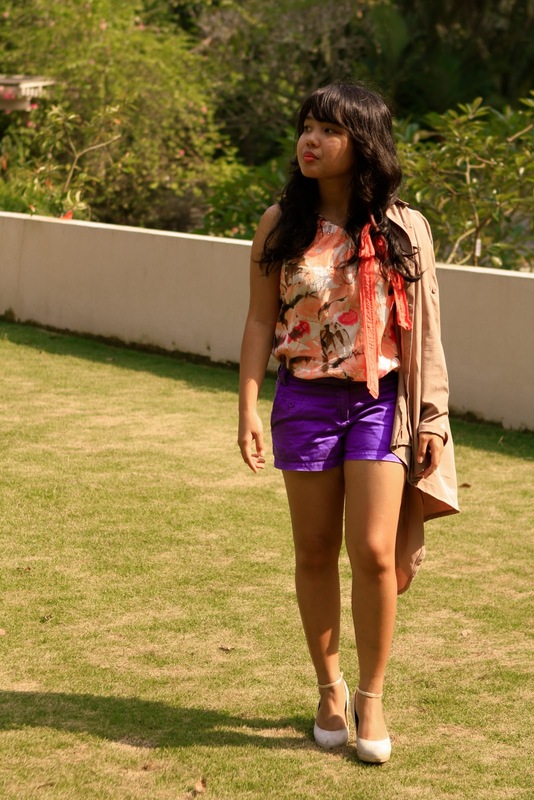 Love how you wore both your colorblocking outfits and love the printed blouse - so pretty!! P.S. Your food tumblr has some preeeeettiful pictures!! You look beautiful! I love all three of these looks. And I totally remember the orange/ivory patterned top from Banana last spring :) I wanted to buy it in purple! I also love the ivory Todd's bag at the top bar, so so gorgeous. Beautiful blog :) I am now a follower! 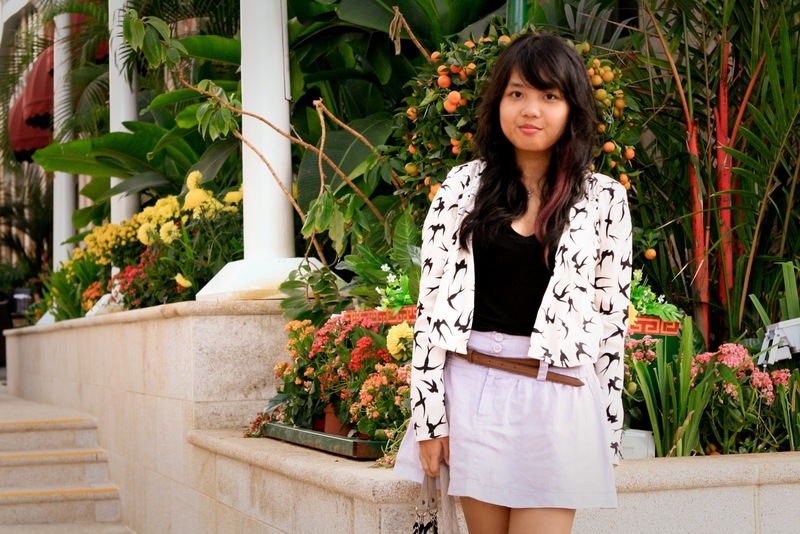 ahh i love that sparrow printed jacket, cute! all 3 outfits are really just done perfectly! i wish it was shorts weather here in norcal, but sadly i'm bundled up in a sweatshirt and huge scarf, sigh! new follower :) and twitter follower as well! I'm usually scared to wear bold colors, but this may have convinced me to give it a try, haha. I love the look with the skirt the most - but I really like all of them! I love al the outfit especially the bird jacket it is too cute!!! AHHHHH THESE ARE INCREDIBLE. I love the colours. I'm a sucker for colour. This strikes me as simply WONDERFUL. the bright pops of color are great on you! I really love the neon and natural outfit! It fits so good together!